The recently concluded Library and Archives Canada (LAC) exhibition Premiere included four drawings by midshipman Robert Hood (c. 1797–1821). These drawings were first presented on the Discover Blog in April 2015, shortly after they had been acquired by LAC. Robert Hood was a talented draftsman, cartographer, scientist, natural historian, and anthropologist before the term existed. He is remembered today for his participation in the 1819–1822 Coppermine Expedition, led by John Franklin. While on this expedition, Hood was the first to document various species of animals and insects. He was also the first to note the electromagnetic nature of the aurora borealis. Posthumously, some of his drawings were reproduced and published in Franklin’s account of the expedition, which included a glowing report on Hood’s work and conduct. While Hood is known, to a degree, for the contributions to scientific knowledge he made during the expedition, his story is also remembered for the part he played in a now infamous love triangle between himself, a Dené woman known as Greenstockings, and Sir George Back, another artist who was part of the expedition. The story, which includes a failed duel between Back and Hood, has been told many times and is neatly summarized in the Dictionary of Canadian Biography entry for Hood. All the members of the expedition were suffering from malnutrition and exhaustion, and Hood did not survive. He was likely near death when he was killed by a fellow member of the expedition, the voyageur Michel Terohaute. Terohaute was executed for the murder, and was later suspected of cannibalism. 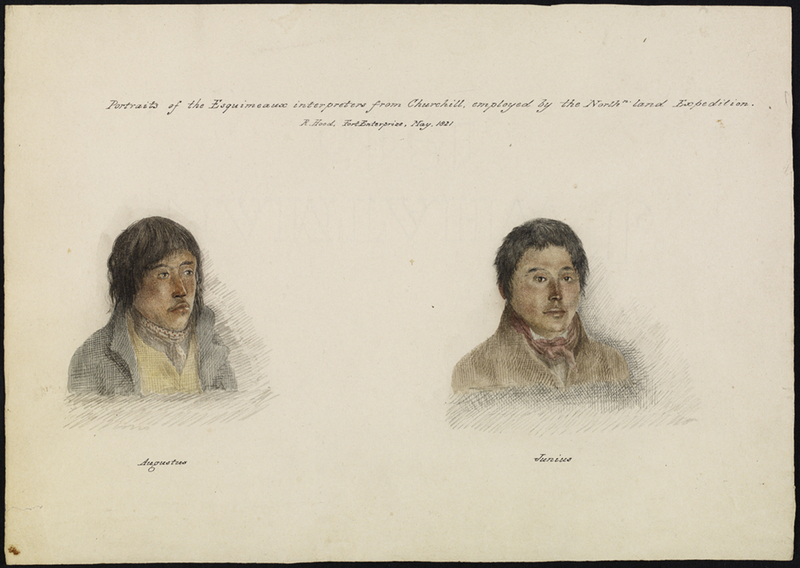 The first of the four drawings shown in the Premiere exhibition is a double portrait of two Inuit guides and interpreters, Tattanoeuck (“Augustus”) and Hoeootoerock (“Junius”). Tattannoeuck was a member of three expeditions, two with Franklin (1819–1821, 1825–1827) and one with Back (1833–1835). He was heavily involved in these expeditions and was well respected by his companions, to the point that Sir John Richardson, a member of both the first and second Franklin expeditions, named a species of butterfly Callophrys augustinus in his honour. Hoeootoerock was separated from the members of the Coppermine Expedition during the crossing of the Coppermine, and is presumed to have died there. 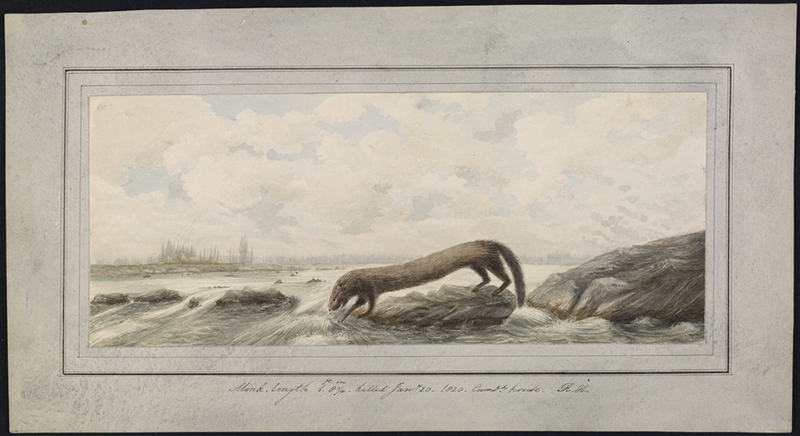 Two of the drawings are depictions of northern mammals: a mink and a cross fox. At the time these works were produced, such species were becoming objects of study in Western European science. Images such as these were among the primary reasons why Hood, an officer with a talent for drawing, was selected for the expedition. 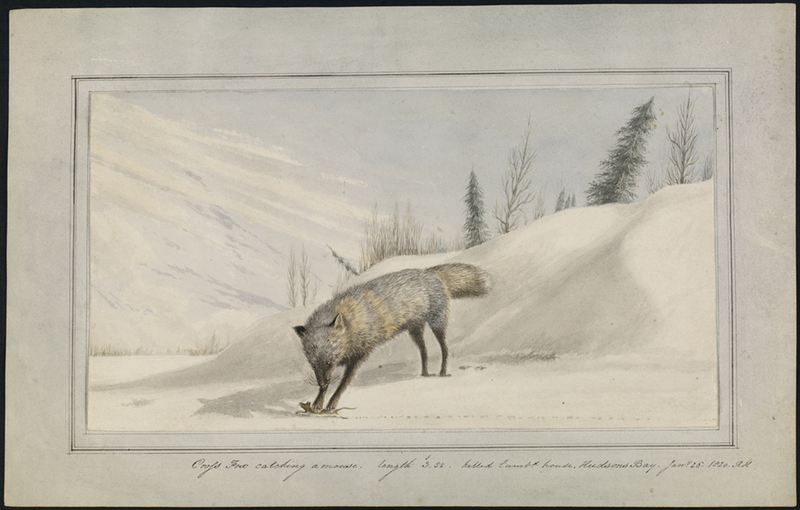 Apart from their aesthetic value, these images were important as evidence of wildlife in the region of the expedition and provided valuable information for the expansion of the fur trade. 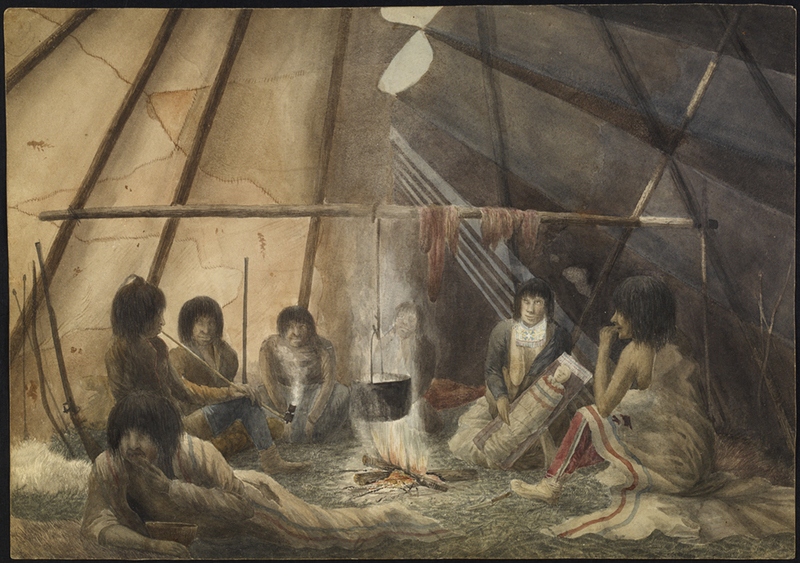 The final and most interesting drawing shows the interior of a Cree tent. The inscription is “Interior of a Southern Indian tent; taken on the Basquiase Hill, Cumberland House, Hudson’s Bay. The tent is made of Moose skin parchment; the cloathes [sic] of the indians are made of skins. The cloth obtained from the English factories. 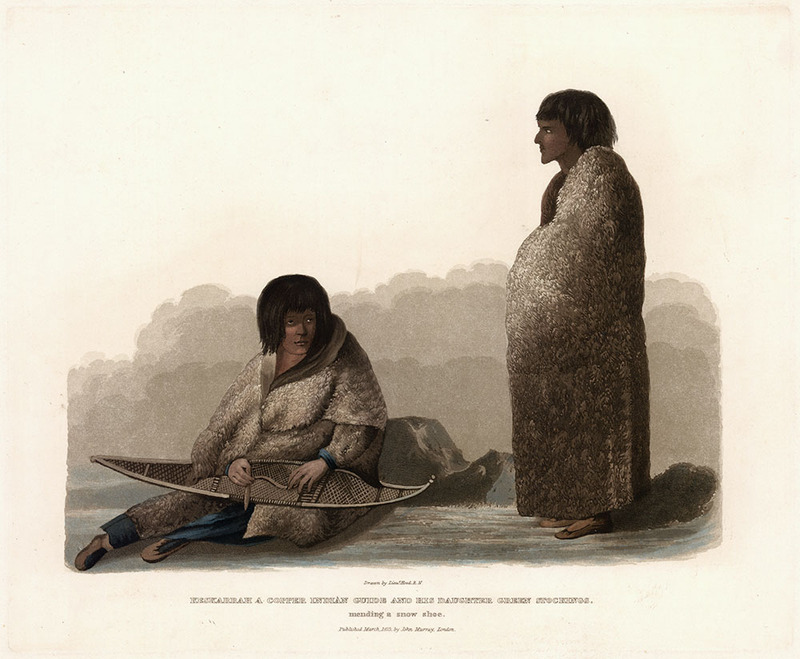 March 25th 1820 Robert Hood North Land Expedition.” The drawing is valuable for the anthropological information it provides and for its historical context. In Hood’s journal from the expedition, he describes making such a drawing on March 31, and he provides several anecdotes regarding the people in the tent. It is yet to be determined if this is that same drawing and there is an inaccuracy in the dates, or if Hood made a second drawing. All four of these drawings relay important documentary evidence about the region of Cumberland House, in what is now northern Saskatchewan. These drawings are also fascinating simply as items carried on that ill-fated journey. The Franklin expeditions are an important part of the history of Canada’s development as a nation, and the tragic aspects of the first expedition in particular have made it one of the most popular and well-known episodes in Arctic history. Shane McCord is an art archivist in the Archives Branch of Library and Archives Canada. This entry was posted in Art, Exploration and settlement, Indigenous Resources, National Identity and tagged Art, Franklin expedition, Robert Hood by Library and Archives Canada Blog. Bookmark the permalink.